I am new to the whole Make-up Revolution phenomenon in the make-up world. Running since March 2014 the brand is pretty new to the market, and offers something for every budget. I love promoting British brands, so the fact the Make-up Revolution hails from London - is even more appealing to me. I’m always a stickler for the brands that I know when it comes to make-up, but the Revolution has taken hold of me and now I know why. When the Beauty product testing team got in touch and asked if they could send me something to review, I wasn't sure what I’d receive. But the lovely team there sent me a make-up revolution highlighter palette, and I must confess I did jump up and down with excitement upon opening the parcel! Filled with a pan of three large powders, and a wonderful full sized mirror – I had high hopes. The buzz around the Makeup Revolution brand, and the fact that this palette was a cheaper alternative to the infamous Hourglass Ambient Lighting palette had me intrigued. On first use (in artificial lighting) the three shades looked promising, and I can see how they can be likened to the Hourglass equivalent. My normal make up routine is filled with bronzer and Benefits high beam, so I am no stranger to illuminating and contouring, and I wasn't disappointed with this palette. The middle shade in particular has been my favourite, a pearlescent shimmery peach shade which highlights exactly what you want it too, without it feeling chalky at all. And just leaving your skin looking natural but with a little somethin’ somethin’ , if you know what I mean? I have started to mix all three shades together and again, they blend seamlessly and would look even more amazing with a tan. The trio blends well with my Bare Minerals powder foundation, and a little of any of these highly pigmented shades, goes a very long way! For £8.00 'Here' this palette is just amazing. The mirror is a generous size meaning (to me) that you’d take this palette with you for normal make-up touch ups, throughout the day and then find yourself highlighting some more. 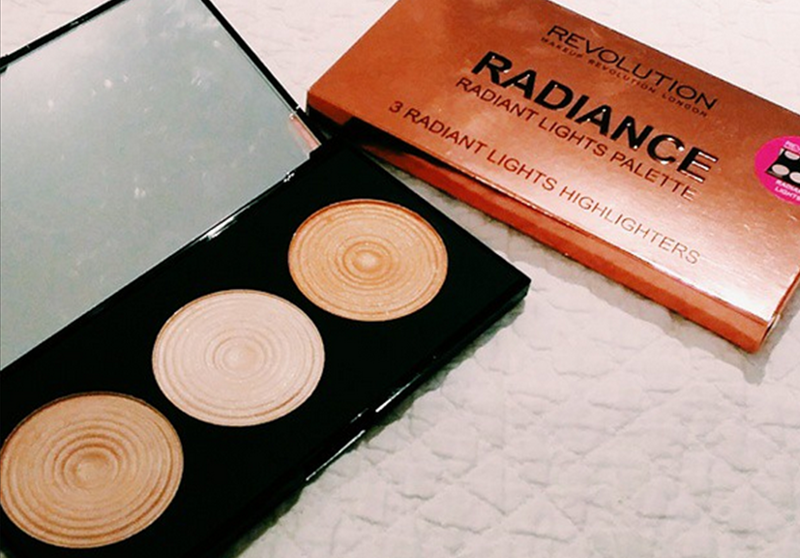 If you have any doubts about this range, then the Highlighter Palette Radiance is a very good starting point. You really won’t be disappointed. I now have a rather extensive Make-up Revolution wish list! Have you tried anything from the range before? If so what’s your favourite? I can then add it to my shopping list! Thanks to the team at Producttesting.uk.com for the opportinuty to try Make up Revolution for the first time. This palette is so pretty, particularly the middle shade, it reminds me a little of the highlighter by the balm.